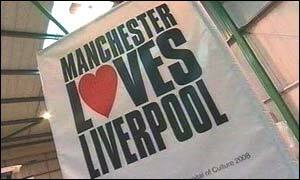 Manchester is declaring its love for its traditional rival Liverpool by sending it a giant Valentines Day card. The 12ft by 8ft card is meant to symbolise Manchester's backing for its neighbour's bid to be European Capital of Culture in 2008. The card was due to be sent on its amorous journey on Friday from Manchester Town Hall down the M62 to Liverpool. The two cities have enjoyed a fierce rivalry going back hundreds of years. Council Leader Mike Storey will then receive the love token outside the city's St George's Hall from Councillor Kath Robinson, deputy leader of Manchester City Council. Coronation Street star Samia Ghadie and Brookside actress Suzanne Collins will also be in attendance. The North West Development Agency, which has organised the card, said it was one of the biggest in the world. Liverpool is on the shortlist of six UK cities hoping to be named as European culture capital.